After an important win over Cavan in their league opener, next up for Galway is a repeat of last year’s All Ireland semi-final and league final against the All-Ireland champions Dublin in Croke Park on Saturday under lights (7pm ). Galway held their own against Dublin in the 2018 league matches, but struggled in the championship clash, and as expected Dublin are strong favourites to win this game. And with Galway currently suffering from a depleted squad, many will be expecting the Dubs to beat the Tribesmen convincingly. The league and All-Ireland champions have not long returned from a holiday, and it is likely Jim Gavin would have planned on gradually reintroducing his players to the match day squads. However, last week’s loss to Monaghan may have altered those plans. Dublin's main objective for 2019 is to be the first side to win five in a row, and Dublin, having not lost two league games in a row under Jim Gavin, will be keen to continue that record. Even with just the one score between them - 2-13 to 1-13 - this was Dublin’s biggest defeat in league or championship since their loss to Donegal in 2014. Dublin will be expected to field a stronger team this weekend and will want to put down a marker after last weekend’s loss, and as a result Kevin Walsh is expecting a tough outing after Dublin's opening day defeat. "We know what Dublin are like in Croke Park, add there will be a natural backlash. They are back home and it will be difficult for us," Walsh says. Galway fans heading to Croker for the evening throw-in will be eager to see a solid performance from their team, knowing the squad is currently different from last year's successful team. With Dublin up next, and then a trip to Monaghan, Saturday's 0-13 to 0-11 win over Cavan was hugely important for Galway's plans to stay in division one for another year. A loss, followed by two extremely tough upcoming games, could have put Galway in a precarious position. Instead the win ensures valuable points have been posted before Galway welcome Kerry to Tuam Sadium for the next home game on February 24. Its importance was emphasised by starting Ian Burke and Liam Silke, while also indicative of their level of respect for the Cavan side under new manager Mickey Graham. Burke at full forward was hugely influential in setting up scores - as seen in the championship last year - while Silke, in a new position at centre back, was a much-needed calming influence on the team. However, this was probably the last time any of the Corofin contingent on the panel will feature before their club All-Ireland semi-final on February 16. In addition to the long-term injuries to Eamonn Brannigan and Paul Conroy, the Daly brothers (John and Micheal ), Barry McHugh, Declan Kyne, and Damien Comer were all unavailable. After low scores in both FBD matches, there was a concern about Galway's scoring ability, but Padraic Cunningham, Shane Walsh and Johnny Heaney all stepped up, scoring nine of their sides 13 points among them. After an underwhelming first half in which the sides finished with five points a piece, the home side began to up the pace in the second half. 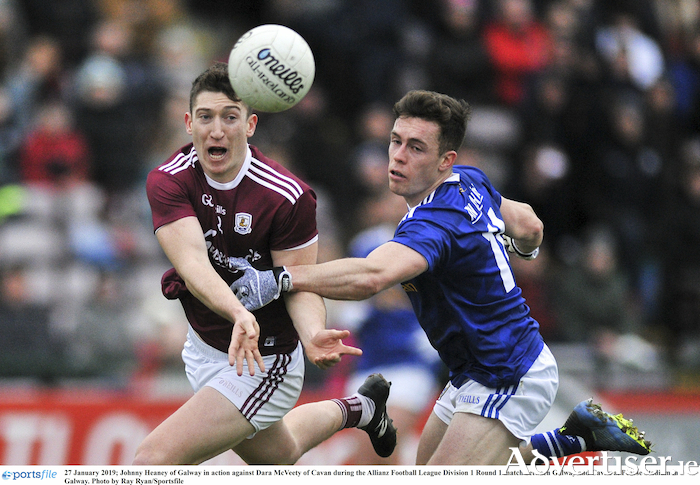 Three black cards for Cavan players in five minutes gave Galway a massive numerical boost, but two black for Cillian McDaid and Peter Cooke meant Galway could not establish a lead until late on in the game. Crucially, however, when the questions were asked, Galway showed the belief and ability to kick on and win. Galway: Ruairí Lavelle; David Wynne, Seán Andy Ó Ceallaigh, Eoghan Kerin; Gary O’Donnell (0-01 ), Liam Silke, Seán Kelly; Ciaran Duggan, Tom Flynn; Cillian McDaid, Peter Cooke (0-01 ), Johnny Heaney (0-03 ); Padraig Cunningham (0-02 ), Ian Burke (0-01 ), Shane Walsh (0-04, 0-04f ). Subs used: Gareth Bradshaw (0-1 ) for Wynne (20 ), Danny Cummins for Cunningham (65 ), Cein D’Arcy for Flynn (70 ), Johnny Duane for Burke (72 ). Cavan: Raymond Galligan (0-1, 0-1f ); Jason McLoughlin, Killian Clarke, Padraig Faulkner; Martin Reilly (0-02, 0-01f ), Barry Fortune, Conor Rehill; Thomas Galligan, Michael Argue; Pierce Smith (0-02, 0-02f ), Jack Brady (0-02, 0-1sl ), Niall Murray; Ciaran Brady, Dara McVeety, Conor Madden (0-02, 0-01f ). Subs used: Killian Brady for Fortune (35 ), Kevin Tierney for Argue (57 ), Paul Graham for Smith (61 ), Cian Mackey (0-01 ) for T Galligan (65 ), Luke Fortune for Faulkner (66 ).